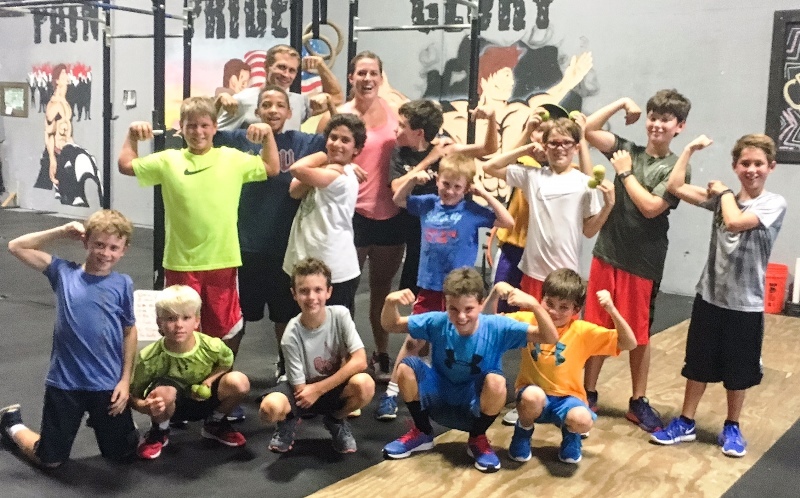 YouthFit is a program customized to ages 7 – 13 with the #1 goal to make fitness fun while preparing the youth athletes for sports and life through broad and general fitness training, developing power, speed, agility, etc. The Youth athletes are entered in Wodify to track progress over time. They love seeing their names and pictures on the screen. The results are also available via an app and website to track performance from anywhere. Update: All recent sessions have SOLD OUT nearly instantly from those on the pre-registration notifications list. If you would like to add your name to the waiting list or join the pre-registration list for the next YouthFit session, please contact us to let us know. The next session of YouthFit is to be determined. There are no set dates yet. 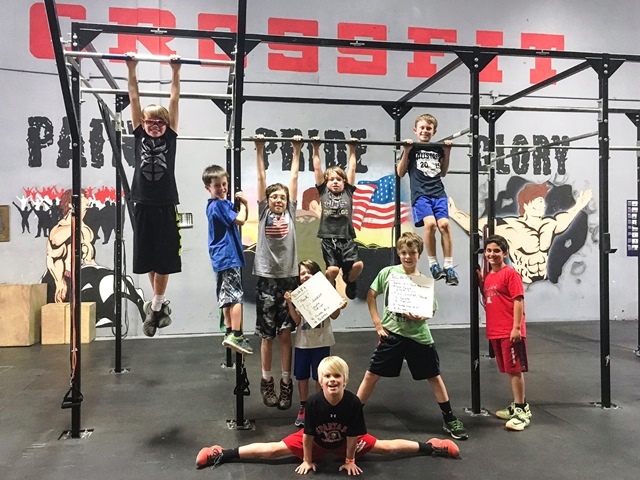 When annouced, the YouthFit sessions will be weekly on evening’s for 8 weeks from 6:30 – 7:30 p.m.
* $15 off for parents who are members of CrossFit PPG. Advance registration for all sessions is required so we can plan accordingly. Please contact us ask if you have questions and we look forward to seeing you there! When one of our youth athletes started, he was not able to do a single proper push-up. You should have seen his face when finished a workout with 45 push-ups in it! Not only did he improve in his push-ups, but YouthFit helped in his confidence in life by losing fat, gaining muscle and improving in sports. Another youth athlete came in being able to a few pull-ups in a PE test at school and wanted to improve his strength and ability to do more. In a recent YouthFit class, he completed 22 unbroken pull-ups (Update: In his re-test a few months later, he completed 31 unbroken pull-ups). That’s improvement, but the best part was that he was encouraging all the other youth athletes who were looking to improve. 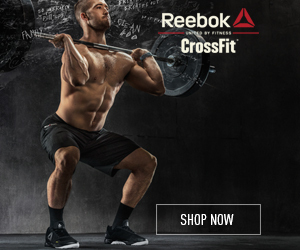 We start with all kinds of scaling for pull-ups (jumping, banded, etc.) and other movements, so everyone can perform the movements as we build strength. 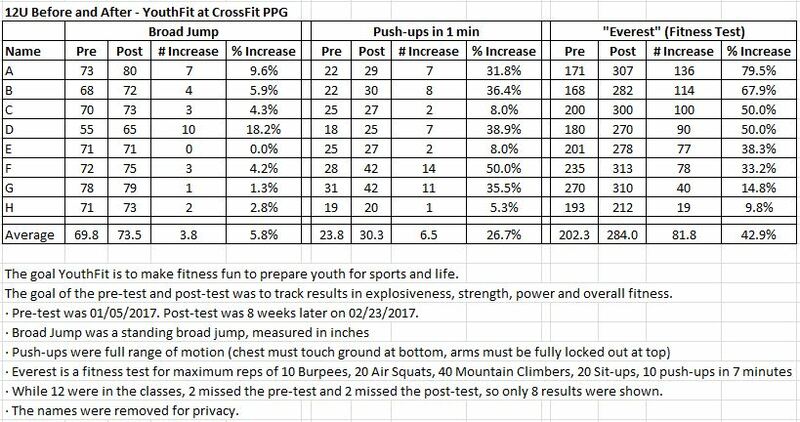 In our last YouthFit session, the youth athletes completed a baseline test at their first and last session that included a series of fundamental movements, mixed with running, for time. 100% improved. For our returning athletes, for some sample times, the times went from 4:38 to 4:24, 4:53 to 4:41 and 5:24 to 5:12, leading to an average of 12 seconds faster, or 4.5% improvement. For our new athletes, for sample times, the times went from 5:10 to 4:44, 5:26 to 4:58, 6:28 to 5:45, 6:29 to 5:52, 6:49 to 6:23 and 6:51 to 6:23, leading to an average of 31 seconds faster, or an 8.5% improvement. Looking for team results? The Norcross 12U travel baseball team came into PPG for Winter training. We always see results in our classes, but the results for this team were truly amazing! A 5-10% increase for new athletes after 8 weeks is typically considered great, but this team showed an average of a 43% improvement in the fitness test. See the detail in the image below. 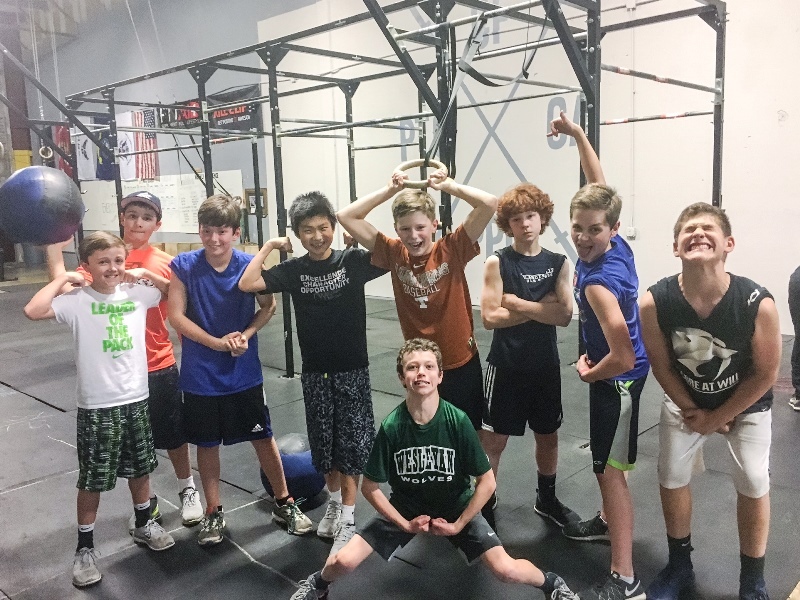 The results speak for themselves – YouthFit at CrossFit PPG is simply the best option for youth to develop power, speed, strength, endurance, agility, etc. to help them in sports and in life! In some cases, our youth athletes will choose to compete in regional competitions where they can prove their fitness and have a great time doing it. One of our 10-year-old athletes has competed in multiple competitions across the region. Not only has he won every competition, he’s won every event at every competition. 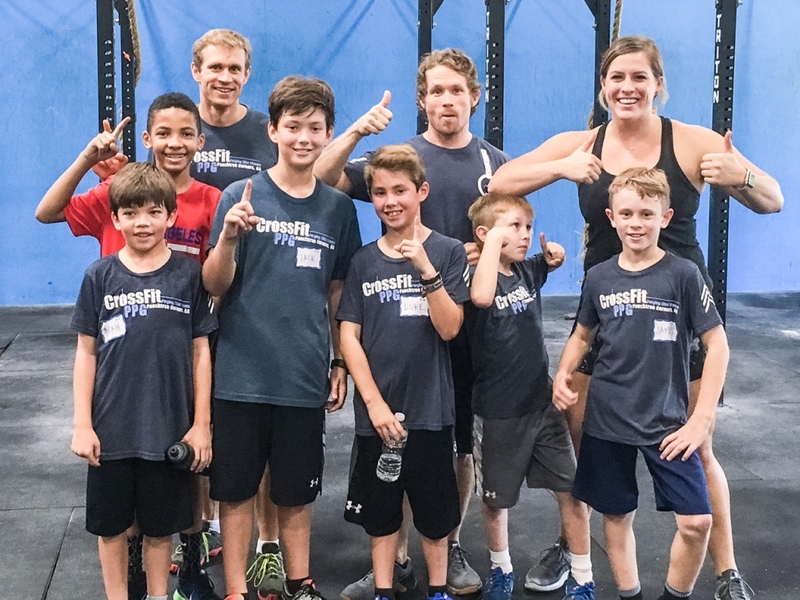 In our most recent events, YouthFit at CrossFit PPG represented well, being “on the podium” in every division (5-7, 8-10 and 11-13). Congratulations to our youth athletes for bringing home the gold from the Garage Games One Competition at Lake Lanier and the Gwinnett Affiliates Competition.